Christopher Lee and Peter Cushing costar in a worthwhile horror attraction — and for once even share some scenes. Amicus gives us five tales of the uncanny, each with a clever twist or sting in its tail. Creepy mountebank Cushing deals the Tarot cards that spell out the grim fates in store; Chris Lee is a pompous art critic wih a handy problem. Also with Michael Gough and introducing a young Donald Sutherland. Starring Christopher Lee, Peter Cushing, Michael Gough, Donald Sutherland, Alan Freeman, Max Adrian, Roy Castle, Ursula Howells, Neil McCallum, Bernard Lee, Jennifer Jayne, Jeremy Kemp, Harold Lang, Katy Wild, Isla Blair, Al Mulock. I saw Dr. Terror’s House of Horrors in 1965 on a double bill matinee with a reissue of the 1953 The War of the Worlds. At the time I didn’t yet know the older film even existed… what a day that was. The packed audience of kids LOVED Dr. Terror. Every plot twist and reveal was met with enthusiastic approval, as if none of them had ever seen a horror movie on a screen before. And I loved it too. In this film I immediately connected with actor Donald Sutherland, who I soon recognized (how could one miss him?) in Die! Die! My Darling! and a little later, in The Dirty Dozen. Being a thirteen year-old fan of Famous Monsters, I also prided myself on already being clued-in to the very special Peter Cushing and Christopher Lee. For some reason the theater didn’t have posters for either film that Saturday, but when those magic names came up on screen kids started cheering. Cushing and Lee were already as beloved as Vincent Price. Dr. Terror’s House of Horrors is the brightest movie made by producer Milton Subotsky, with the possible exception of his stylish Horror Hotel from a few years before. Few omnibus films of any kind were particularly successful, and with the exception of Roger Corman nobody had tried a horror anthology movie since the superb Dead of Night, which by 1964 was an entry in a few reference books and very difficult to see in the United States. Subotsky wrote many of his movies as well. His screenplay for Dr. Terror has a couple of effective episodes and a couple too sketchy and brief to gain traction. But the spooky framing story works very well indeed. 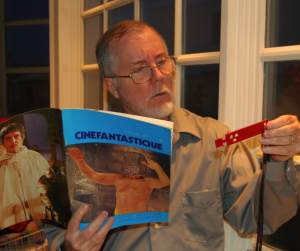 Half a dozen pictures into his directing career, former director of photography Freddie Francis hasn’t yet grown weary of work on horror pictures. He may have thought he’d be offered material like the all-time winner he shot for Jack Clayton, The Innocents, but that was not to be. Just the same, he gives this show the professional touch it needs. In 1964 many suburban boomer kids had never heard of Tarot Cards, which made the deck of Dr. Schreck (Cushing) quite interesting to behold. Schreck joins a group of five male train passengers, and maneuvers them into letting him tell their fortunes. This introduces five varied horror segments. Architect Jim Dawson (Neil McCallum) is on his way to work on a house, not knowing that a werewolf is at large in the remote community. Bill and Ann Rogers (Alan Freeman & Ann Bell) return from vacation to find a strange, difficult-to-prune plant growing next to their house. They have no idea how dangerous it is. Jazz man Biff Bailey (Roy Castle) takes a gig in the West Indies, intrudes on a strange ceremony and steals a great Voodoo tune. When he premieres the music back in London, supernatural chaos breaks loose. Imperious critic Franklyn Marsh (Christopher Lee) cruelly attacks the work of painter Eric Landor (Michael Gough), who can’t stand the humiliation and plays a joke that causes Franklyn to lose face. Franklyn runs Eric over with a car, severing one of his hands and bringing his painting career to a halt. But will Landor get his revenge? Finally, doctor Bob Carroll (Donald Sutherland) tells his associate Dr. Blake (Max Adrian) that his wife Nicolle Carroll (Jennifer Jayne of The Trollenberg Terror) is suffering from a strange malady. Blake figures out that Nicolle is a genuine vampire, and urges Bob to put a stake through her heart as soon as possible. Can Bob kill his own wife? Although none of the episodes in Dr.Terror reach classic status, all are engaging. Episodes one and two are sketchy items that seem to end before they get going. The hero of the first story tries to avoid the werewolf menace in the house of his rich client (Ursula Howells) but it comes at him from a completely unexpected direction. The vine menace of episode two barely gets going before it’s over, introducing two supporting characters nicely acted by Jeremy Kemp and Bernard Lee. In a repeat of Francis’s unconvincing foliage monsters in The Day of the Triffids, the killer vine never really seems dangerous. The abrupt ending wants to give us chills by suggesting that the war against the shrubbery is already lost, but we’re more likely to think that some important film footage went missing. The production gets into gear in the Voodoo episode, with some larger-scale staging and a nice chase scene. Subotsky’s background in music-oriented films shows in a couple of fairly classy jazz sequences. But with its emphasis on Voodoo as sinister and blacks as evil ‘others’ mainly shows how blatantly racist English pop culture was in 1965, even compared to our own. We kids recognized justice being done at the conclusion, but the ominous black intruder is still the ‘monster,’ the bogeyman. The last two episodes are the most successful. Christopher Lee is excellently cast as the obnoxiously haughty art critic. We’re surprised to see Lee project palpable fear instead of his usual cold menace. Lee’s skill is especially apparent when we realize that he’s keeping the thin story flying while working with a real handicap, an unacceptably phony disembodied prop hand. Michael Gough grins and grimaces as the victimized painter, a performance nicely keyed to the tenor of the episode. The final vampire story is also redeemed by committed performances, working a rather simple twist onto a familiar tale of a parasitic bloodsucker. Max Adrian convinces as the doctor that advises murder as a cure for vampirism, and Jennifer Jayne is suitably exotic as the French wife whose soul needs to be saved. But Donald Sutherland brings the all-too-brief segment to life with a very fast sketch of a concerned and somewhat confused husband. We’re immediately pulled into his problem. Of the five haunted train passengers, Sutherland’s vulnerable and awkward doctor is the most compelling. Had someone remade Dead of Night, Sutherland would have been ideal as the timid main character haunted by interlocking dreams. His is the film’s most memorable performance here. Olive Films’ Blu-ray of Dr. Terror’s House of Horrors would seem to be the first decent video presentation of this well remembered matinee chiller. As it was filmed in half-frame Techniscope, pan-scanned prints for Television were very poor. This richly colored transfer gets a B+ for color — face tones are sometimes a little weak — and an A- for overall quality. The widescreen Techniscope framing is excellent, showing that Freddie Francis shot with economy and a degree of artistic involvement. A lot of us are glad this one came along in such a good presentation. The very good music score is by Elisabeth Lutyens, who also did the music for odd Hammer titles like Never Take Sweets from a Stranger, and Amicus’ own The Skull. Like many composers of ‘fringe’ film music, Lutyens was a prolific composer of concertos, symphonies and string quartets. The box art is excellent. I assume it was taken from a foreign poster. I finally did see a domestic release poster, which isn’t as inspiring. The Amicus Production was released here by Paramount, hence the use of War of the Worlds as a co-feature back in 1965.